The term “racketeering” can be traced back to the Racketeer Influenced and Corrupt Organizations (RICO) Act, and includes 35 crimes related to organized crime and the act of offering a dishonest service in order to solve a problem. The RICO Act became law in 1970 in an effort to go after organized crime. However, the law has arguably been used since then to accuse individuals and sometimes even organizations of serious crimes under the law that do not fit with the purpose and intent of the RICO Act—crimes that some might say are being used simply to harass those accused. These laws very generally make it a crime for organizations, individuals, or “enterprises” to receive funds through a collection of unlawful debts and/or illegal conduct engaged in by organized crime. 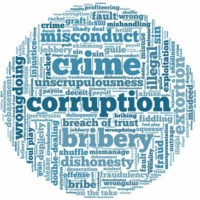 This includes states such as New York, which defines enterprise corruption as having knowledge of the existence of a criminal enterprise and the nature of its activities while being engaged in various activities such as intentionally participating in the affairs of this enterprise and its pattern of criminal activity. The RICO Act now has its own history of being used in contexts that stray far from organized crime, which was the purpose behind its original passage. For example, in response to a lawsuit brought by various nonprofit animal organizations against the Ringling Bros. under the Endangered Species Act in 2000, Ringling Bros. in turn filed a lawsuit claiming that the plaintiff animal protection organizations had violated racketeering laws, resulting in years of litigation and a subsequent settlement once these nonprofit organizations could no longer afford to financially fight the RICO claim. On April 9th, the New York Times highlighted another example of racketeering charges brought under the RICO Act: a high-profile professor who was fired from his job and accused of racketeering in a case that was eventually dismissed by a state judge. Specifically, he was accused of partaking in a scheme that involved robbing the university he worked for of more than $1 million (i.e. misusing university funds and research for the benefit of his own startup company). If he had been convicted, he could have faced serving between 10 and 40 years in prison and paying a significant fine. The prosecution was a huge surprise and blow to the professor, his family, and the entire academic community, as he’d been somewhat of a superstar in attracting grants and funding to the university due to his work. Not only was he fired and accused of these crimes, but the state Bureau of Investigation raided his home and office. Many people who are accused of crimes feel blind sighted and lost as a result. Most never imagine that the day would come when they would be accused of such a thing. Speaking with an experienced criminal defense attorney is your hope for ensuring that you do not serve time for a crime that you did not commit and have been falsely accused of. Contact the office of Phillip J. Murphy today to speak with an experienced criminal defense attorney, free of charge. We loyally serve clients throughout New York and New Jersey.